If you’re looking for lots of cargo space without jumping to a crossover SUV, explore the Volkswagen Golf SportWagen S 4Motion. Downers Grove and Chicago drivers can expect the premium cabin and high fuel economy they expect from the Golf, but the hatchback SportWagen S provides 66.5 cubic feet of space for groceries, sports equipment, or luggage. The Golf SportWagen S 4Motion is powered by a turbocharged four-cylinder engine, and it features 4motion all-wheel drive, making it easier to stay in control when the roads are slick. Why Buy a Volkswagen Golf SportWagen S 4Motion from Autobarn VW of Countryside? 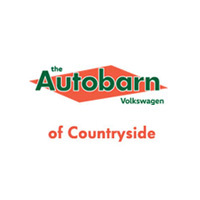 Autobarn VW of Countryside works toward an exceptional customer experience for all Chicago and La Grange drivers. Contact us to schedule a test drive, and be sure to visit our finance department to learn about our lease and loan programs at competitive rates. Autobarn VW also offers a service department with convenient hours and factory trained and certified technicians.